Is It Fair For Baseball To Reject Drugs But Embrace Surgery? July 26, 2013  Doping in sports is back in the news. And once again we are reminded that our attitudes on the topic are complicated and not entirely transparent even to ourselves. Commentator Alva Noë wonders where we draw the line when it comes to altering our physical and chemical selves. July 15, 2013  The revelations are another blow to a sport that's been marred by doping. 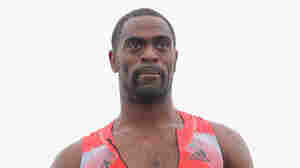 Tyson Gay, one of the athletes who failed a drug test, was a best-hope sprinter for the United States. He said he did not "have a sabotage story."